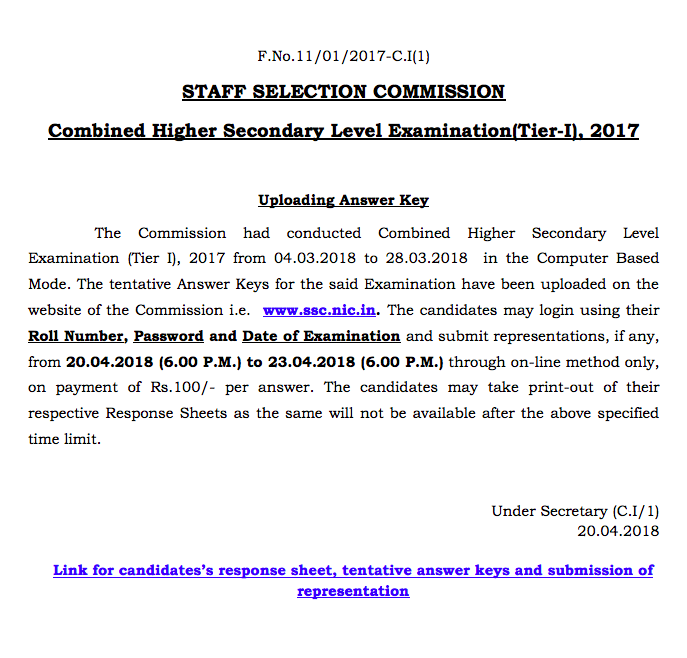 The Commission had led Combined Higher Secondary Level Examination (Tier I), 2017 from 04.03.2018 to 28.03.2018 in the Computer Based Mode. The provisional Answer Keys for the said Examination have been transferred on the site of the Commission i.e. www.ssc.nic.in. The competitors may login utilizing their Roll Number, Password and Date of Examination and submit portrayals, assuming any, from 20.04.2018 (6.00 P.M.) to 23.04.2018 (6.00 P.M.) through on-line strategy just, on installment of Rs.100/ - per reply. The competitors may remove print-from their separate Response Sheets as a similar won't be accessible after the above indicated time restrain.